TLV products are designed from the outset to help minimize life cycle cost. The A3N is quality-made for durability, ensuring long-term stable operation. With its high discharge capacity and pressure range up to 230 psig, the A3N can be used on a wide range of applications ‒ from steam mains to light processes. The predecessor of the A3N, the A3, appeared in 1958. Ten times more durable than conventional traps in its day, this line is a longtime bestseller. In traps with a single-layer cap, adverse atmospheric conditions and radiant heat loss result in steam loss from no-load actuation and blowing. While this problem is partly solved with an air-insulated jacket, the A3N’s steam-heated and condensate-cooled jacket offers the greatest protection, ensuring the most stable operation of all thermodynamic steam traps. Some valve discs include an air leak pathway or rough finish to prevent air binding. However, this can result in greater surface wear and steam leakage due to no-load actuation. The A3N solves this problem: the bimetal air vent ring eliminates air binding and allows the hardened sealing surfaces to be mirror-polished, resulting in a tight seal that saves steam. To reach full operating efficiency, air and condensate must be purged from steam lines. The bimetal air vent ring quickly and efficiently vents traps for rapid start-up without air binding and makes manual blowdown unnecessary. Disc-type steam traps often fail from wear due to the repetitive impact of the valve disc against the valve seat. With the A3N’s replaceable module, these parts can easily be replaced as a single unit, reducing replacement time and maintenance costs. Steam loss due to adverse weather conditions such as rain and wind is drastically reduced by the steam jacketed pressure chamber. A typical disc trap loses more steam when exposed to rain than under fine weather conditions. In contrast, the A3N, with no difference in steam loss due to weather, is virtually unaffected by ambient conditions. Internal parts have been developed to provide tight sealing, which reduces wear and prolongs service life. While a conventional disc trap generates 3.5 lb/h of steam loss when brand new and 6.6 lb/h after three years, the same values for the A3N are only 0.9 lb/h and 2.8 lb/h, respectively. Automatic air venting reduces start-up time, greatly improving productivity. Additionally, reductions in steam loss, fuel consumption and labor can be achieved by eliminating the need for manual blowdown at start-up. Tests indicate that by preventing air binding, the A3N can reduce start-up time by 15 minutes ‒ a reduction of approx. 60%! TLV disc traps have been designed to facilitate the replacement of just those parts affected by wear. This helps lower replacement costs and speed-up maintenance. With the replacement module, the valve disc and valve seat can easily be replaced by removing the outer and inner covers. Traps can be repaired in-line without the need for specialized equipment. When disc traps fail, a common practice is to replace the entire trap, not just the internals. Short service life results in high replacement costs. TLV ThermoDyne disc traps have been engineered to save time and minimize maintenance costs. The replacement module design enables quick and easy inline repair of normal wear parts without having to replace the entire trap. During startup, the trap is cold and the bimetal air vent ring is contracted, keeping the disc valve raised. During this time, large amounts of initial air and cold condensate can be discharged from the trap. 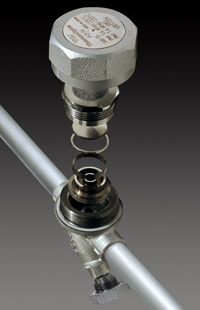 The bimetal air vent ring holds the disc valve open, preventing air-flow obstacles (air binding). As steam enters the trap, the bimetal air vent ring is heated and expands, quickly slipping down to the valve seat skirt, freeing the disc. The steam flows rapidly under the released disc and the jet creates a low-pressure region (Bernoulli's principle). The steam jet flows into the pressure chamber creating a high pressure region as the steam loses velocity and is compressed. This pressure pushes the disc valve down to close the valve seat. When condensate enters the trap, the temperature in the pressure chamber drops, causing the steam to condense and the pressure to drop. If the pressure becomes lower than the inlet pressure, the disc valve opens to discharge condensate. Soon after the condensate is discharged, the valve closes utilizing the same principle. In this manner, the valve opens and closes automatically to intermittently discharge condensate that enters the trap. * For applications where precise temperature control is necessary, Free Float® type steam traps are recommended.